Welcome to the world of style! Take a break from the sea and the sand and indulge in a morning or afternoon shopping spree! 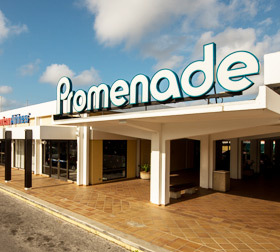 In the PROMENADE SHOPPING CENTER you will find it all: an attractive mall with lots of tropical plants and trees, a shadowy shopping arcade with food & beverage facilities. Shops offer a diverse collection of quality merchandize, mostly from Europe, with world famous brands. All shops accept major credit cards as well as US dollars. For your convenience, there’s a ATM machine, a postbox (daily pick up), a phone booth and bathroom facilities.